The high performance non-volatile electrolyte, formulated with a low viscosity mix of ionic liquids for best charge transport. 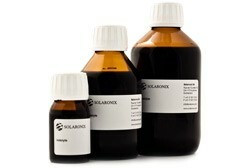 Solar cells prepared with Mosalyte TDE-250 can exhibit exceptional stability and very long lifetimes. This electrolyte is best used with TiCl4 treated titania electrodes for high performance.